Over 200 gauges available. Choose from commercial, industrial and process style gauges. Meets ANSI B40.100 Requirements..
Commercial Gauges feature a Stainless Steel case with Brass internal parts and connections. Window is Polycarbonate. Available Dry or Glycerin filled in 1 1/2", 2 1/2", 4" and 6" Dial. 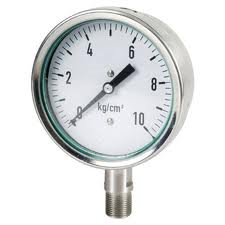 Industrial Gauges feature a Stainless Steel case with Stainless Steel internals and connections. Window is Polycarbonate. Available Dry or Glycerin filled in 2 1/2", 4" and 6" Dial. Process Gauges feature a Phenolic case and Polycarbonate Window. Stainless Steel internal parts and connection. Available Dry or Liquid Filled. Available in 4 1/2" and 6" dials. Also available in ANSI Flange and with Diaphragms installed. These gauges include 4" and 6" dials, Stainless Steel internal parts, connections and housing. Offered with medium pressure and high pressure connections. Pressures up to 60,000 PSI.